Previewed at: Roadshow Theatrette, Pyrmont, Sydney, on 27 November 2017. Tommy Wiseau’s 2003 movie The Room has a cult following in various cities around the world - if you’ve ever had the extraordinary experience of attending a full-house screening on a Friday night in Sydney and hurled plastic spoons at the screen, you will be hanging out to see The Disaster Artist, about the making of this bizarre film. James Franco directs and stars as Wiseau in this crazy production which will be embraced by fans but may well leave the uninitiated in its wake. Franco is mesmerizing and once again displays how adept he is at transforming himself into diverse characters, such as he’s portrayed in 127 Hours, Spring Breakers and National Theatre Live: Of Mice And Men, to name a few. And let’s not forget his spot-on representation of James Dean in 2001’s eponymous telemovie about the tragic star. He’s prolific yet manages to maintain an above average score of exceptional performances. The film opens with Wiseau (James Franco) attending a theatre workshop in San Francisco where he gives a way over-the-top rendition of Stanley Kowalski’s ‘Stellaaaaa…..’ scene from A Streetcar Named Desire. Although surprising most, his routine is embraced by a fellow student actor, Greg Sestero (Dave Franco, James’s younger brother), who’d previously struggled with his own audition and the two buddy up. Wiseau suggests they head off to Los Angeles to follow their dreams and reveals that he owns a flat where they can both stay. Needless to say, roles don’t come their way and they decide to make their own film after being rejected one too many times; Wiseau sees the light when he realises that no-one understands or even likes him and the only way he can prove his worth is to do his own thing - to never give up. He tells Greg that he can bankroll the movie and the crazy project gets under way. The hopeful, hopeless pair has little idea of the process of filmmaking but, undeterred, set out to hire a cast and crew of unknowns. Conversely, in Franco’s version the likes of Sharon Stone, Melanie Griffith, Seth Rogen, Zac Efron, Bryan Cranston, ‘our own’ Jackie Weaver, and more, were lining up to be part of the action. It’s the on-screen presence of the Franco siblings, however, that’s both compelling and nerve-wracking to watch. Wiseau remains an enigma and little is known about him or how he made his money - enough to foot the bill on a shoot that purportedly cost around US$6,000,000 to make. Strangely, he hired both digital and film camera crews and when he appeared on screen it was not unusual for him to need a number of takes - even if the last one was just as bad, and the same, as the first. Franco nails his unusual accent (which is vaguely Eastern European) and his look, which is somewhere between a Goth and a hippie - channelling Jim Morrison in his Lizard King era. He was already retro in the noughties when he made his first appearance on screen. Many of the scenes from The Room are faithfully and exactly reconstructed and you get to view a direct comparison of some of them prior to the closing credits. It is also really interesting to see the likeness between Franco and Wiseau (who makes a post-credit cameo appearance), although it must be said that the former can’t really hide his good looks. 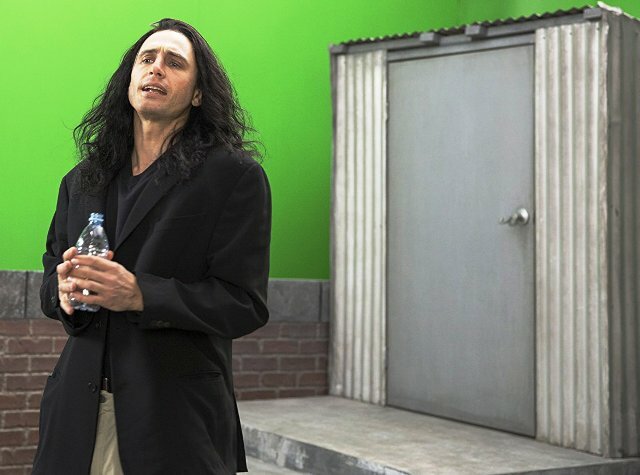 The success of The Disaster Artist will depend to a large degree on the audience The Room generated and could possibly push Wiseau back into the spotlight. Still, if you haven’t seen the original, this partial re-make can be seen as a portrait of a man driven purely by self-belief… and utter self-delusion. You’ll certainly have a few laughs but you may also feel empathy for this unusual character who’s like no other. HA HA HA HA HA HA HA HA, as Tommy would declaim!